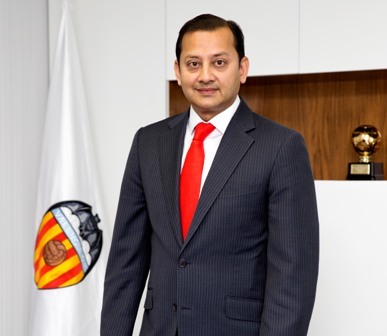 fcbusiness speaks to Valencia CF President, Anil Murthy the former Singapore Diplomat whose transition to the world of football has been anything but easy. Given his background, Anil Murthy could have struck a more conciliatory tone. But at Valencia CF’s Annual General Meeting in November last year – one of his first major public appearances since being named chairman – the former Singapore diplomat had a point to make. “Today we are acting to stop ‘fake fans’ whose intention is only to damage the club and sell fake news to our real fans. We know who the real fans are. Not the types who claim to protect the club and yet stone the team bus and threaten the players,” Murthy told the AGM. The “fake fans” he referred to were “ultras” who attacked the team bus in December 2016, when Valencia were fourth from bottom. Other demonstrations followed, specifically targeting Lim, the Singaporean businessman who bought the debt-ridden club in 2014. A football-obsessed billionaire, Lim purchased 70 per cent of Valencia for €94 million. He now owns more than 80 per cent. Following nearly 16 years diplomatic service for the Singapore government, Murthy first joined the club as a director before being appointed chairman in July last year. He wasted little time getting his message across. “The message at the AGM was important because a very vocal minority was speaking on behalf of everyone. But in my six or seven months at the club (as director) I had realised the majority of fans and people in the city were not only thankful to Peter Lim for saving the club from nearly disappearing, but they were aware that things take time,” he tells fcbusiness.